Hey everyone! It's Jeannie, back again with another card using the More than Pie stamp set. 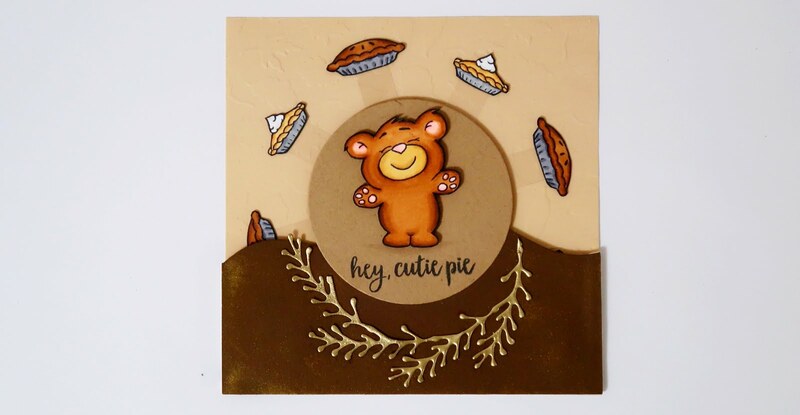 I noticed the bear that wasn't holding any pie and wanted to surround him with pies! Using acetate, I created a spinner wheel for the pies to stick to and spin around the bear. For the bear to be in front, I had to create a stationary piece that the pies can move freely behind. That's where foam tape comes in handy. It's a bit hard to explain in words, so I'm also including my YouTube Video Tutorial for it. Regardless, I think the card comes out to be really cute and it's an easy card made interactive by adding a brad to it. The acetate also makes it look like the pies are floating as long as you don't look too closely. Hopefully, you enjoyed this card and checked out the video to learn how to create one as well. Thanks for visiting and I'm sure I'll be back with another card for you guys soon.